Designed as a short range, ultra simple self defense pistol the Wiener Waffenfabrik “Little Tom” was the first double action semi-automatic pistol ever created. Made in .25ACP (6.35x16SR) and .32ACP (7.65×17 Browning SR) these were small pocket pistols such as were popular in much of Europe prior to the First World War. Created by Czech firearms designer Alois Tomiska whilst he was living and working in Vienna, Austria, where he had learned his gun-smithing trade, Tomiska created this pistol around the year 1900. Left side view of the “Little Tom” shows the safety catch, which is operated in the opposite way to the safety of the later Beretta M1934 and M1935. (Picture courtesy Rock Island Auction). The “Little Tom” gets its name from the name of its designer Tomiska. Typical of Austrian made firearms these handguns are well made and have a solid and well balanced feel about them. It took Alois Tomiska about eight years to complete the design of this pistol and obtain both British and Austrian patents for it. 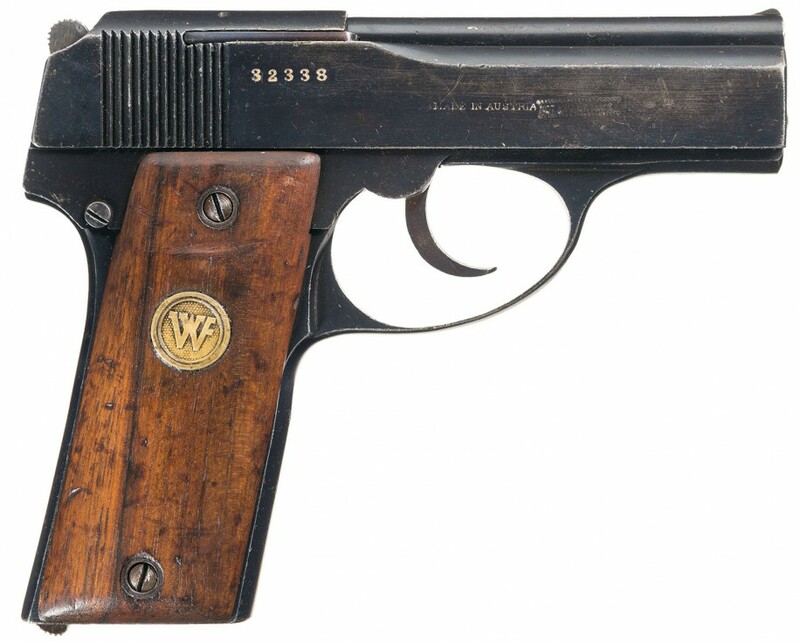 He started his own company to manufacture the pistols and called it Wiener Waffenfabrik which translates as Vienna Firearms Works in partnership with a man named Camillo Frank and began production of pistols in both .25ACP and .32ACP around 1909. Sales were quite slow but Tomiska continued to work on refining his designs and obtaining additional patents, finally selling his business in 1919 and moving back to his native Czechoslovakia where he worked for Jihoceska Zbrojovka (South Czech Weapon Works) which later became a part of Ceska Zbrojovka (CZ). At Jihoceska Zbrojovka he worked on the designs for the Vz22, 24 and 27 pistols and also made his own licensed versions of his “Little Tom”. He passed away in 1946 having lived through the two great wars of the twentieth century. About 40,000 to 50,000 of these Little Tom pistols were made, the majority being in .25ACP so the larger .32ACP is a rare bird indeed. For people who are familiar with modern pistols the Little Tom seems to have a peculiar way of managing the magazine although it is in fact very similar to the top loading pistols being produced by Austrian manufacturer Steyr at the time, which used top loading stripper clips to load their fixed internal magazines. The Little Tom has a removable magazine, usually made of brass, but it has to be pushed up through the top of the open pistol action to remove it. Some Little Tom pistols have been altered to facilitate the bottom loading most of us are familiar with though none were originally manufactured like that. The video below provides a good look at the functioning of the Little Tom and includes shooting it and field stripping. 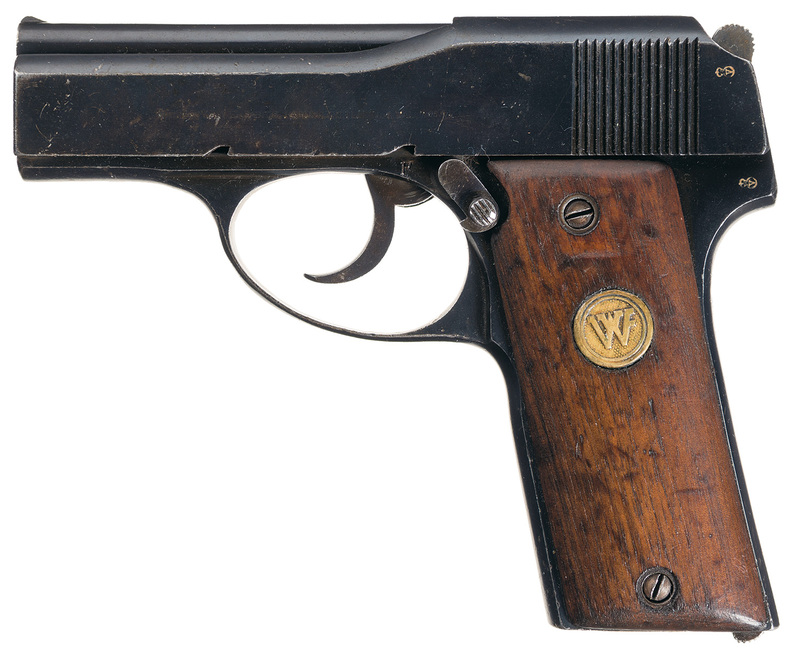 The Wiener Waffenfabrik “Little Tom” pistol we have featured in the pictures in this post is coming up for auction by Rock Island Auction on February 25 – 28, 2016. You will find the Rock Island Auction page if you click here. For more information about the Wiener Waffenfabrik “Little Tom” pistols there are interesting and informative pages to be found if you click here, here, and here. These pistols make an excellent addition to a collection of early pistol designs. In fact being the first ever double action semi-automatic pistol ever produced they are an essential addition to such a collection.